Students explore whole grains and prepare the recipe, Vegetable Fried Rice with purple cauliflower, sugar snap peas, baby shiitake mushrooms, and rainbow carrots! 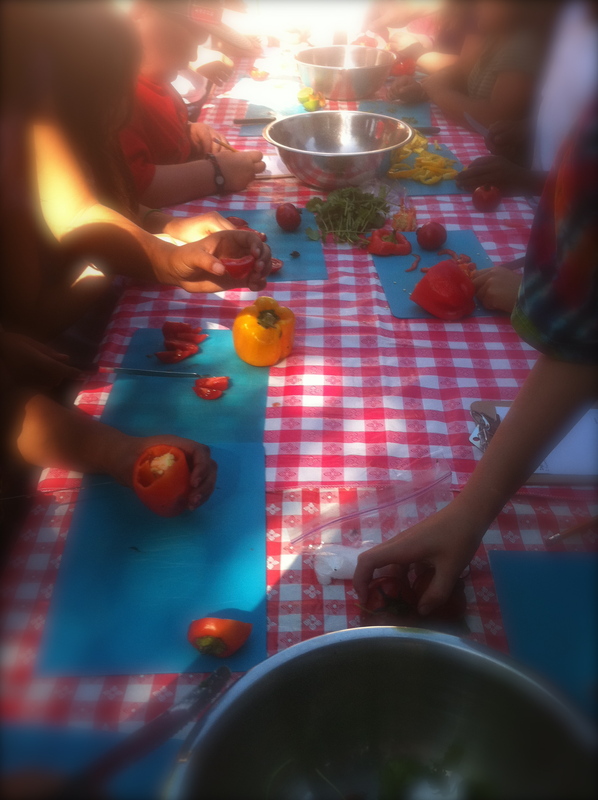 I feel honored to teach cooking classes to a group of autistic children every month. 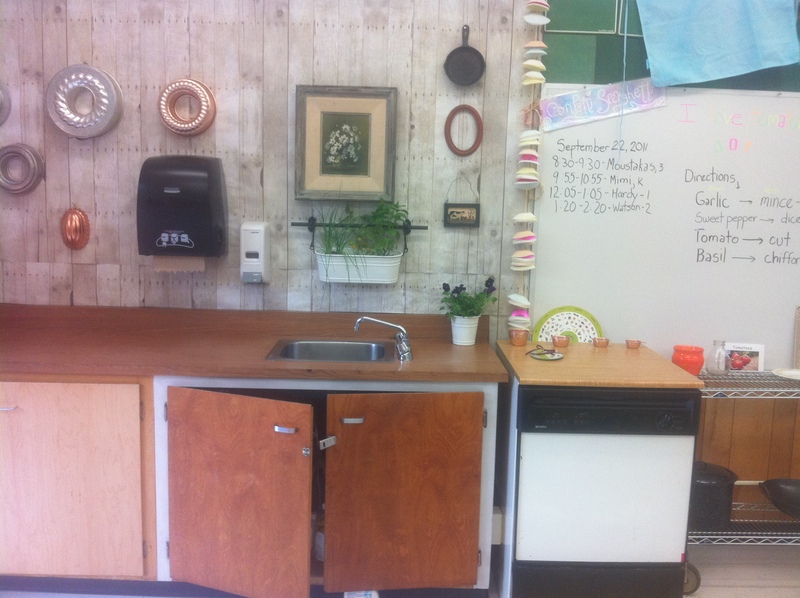 The kitchen is a natural learning environment, and the ritual of cooking classes help students with autism build their functional life skills, engagement, and communication. 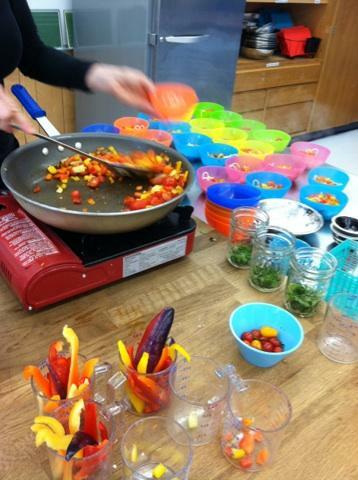 Teaching cooking lessons to students with autism have many more similarities to other students than differences, both learn well with hands-on experiential practices. Built on previous years, these students have become very proficient with their slicing, dicing, and measuring skills, along with the other routines of eating and cleaning up. 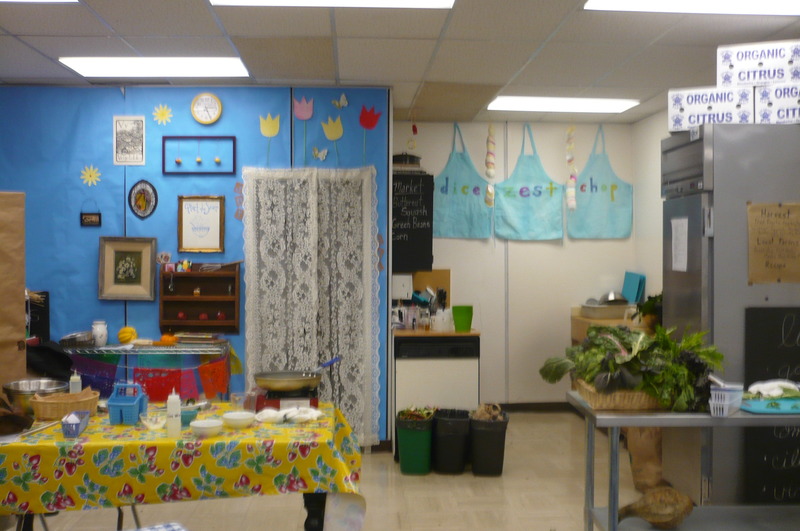 Encouraged with the cooking successes, their classroom teacher invited me to return on another day to participate in a show and tell activity, focusing on the sense of touch. I was excited to volunteer my roommate and companion, a chocolate Labrador Retriever, named Rocky, to become the focus of their activity. When we arrived, Rocky was excited by all of the students, but it didn’t take a long time for him to settle down. Some students eagerly came over to pet him, while others remained cautious at a distance, and some slowly inched forward. 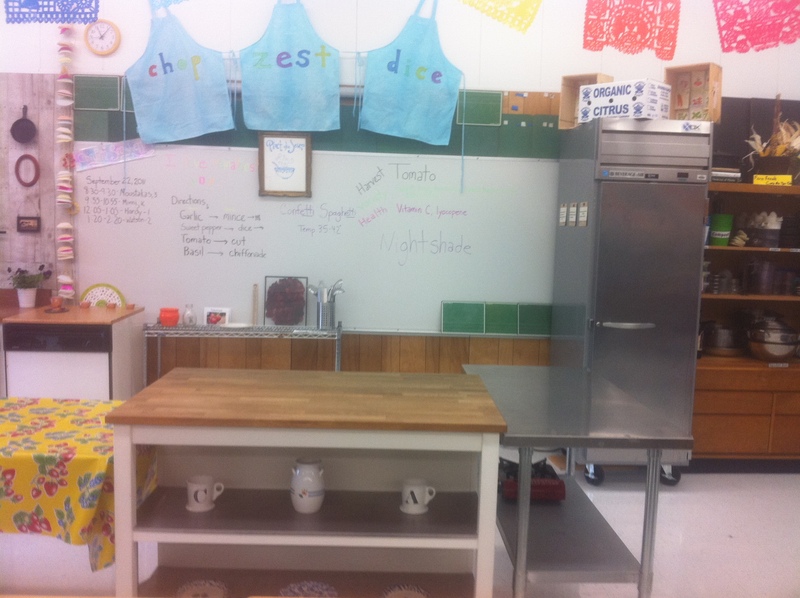 The process for each student is unique, and like with food, there isn’t pressure to participate. Now, nine months later, Rocky, a certified therapy dog, continues to visit monthly and students happily pose with their arms around him for photos. He is a conversation starter for some, comforting for others, and therapeutic for all. One non-verbal student whispered a story in my ear, about a neighbor dog, immediately after petting Rocky. His teacher was amazed since he rarely interacts with others in this manner. Another student who would not remain in the same room with Rocky last year, now eagerly participates in petting him. It’s exciting to be part of the positive changes that Rocky will bring to this group of students throughout the year. Although the benefits of therapy dogs are well documented, for Rocky, it’s just another workday of fun! Students compare and contrast different tree fruits using sensory descriptive words to describe the taste and flavor of each fruit. 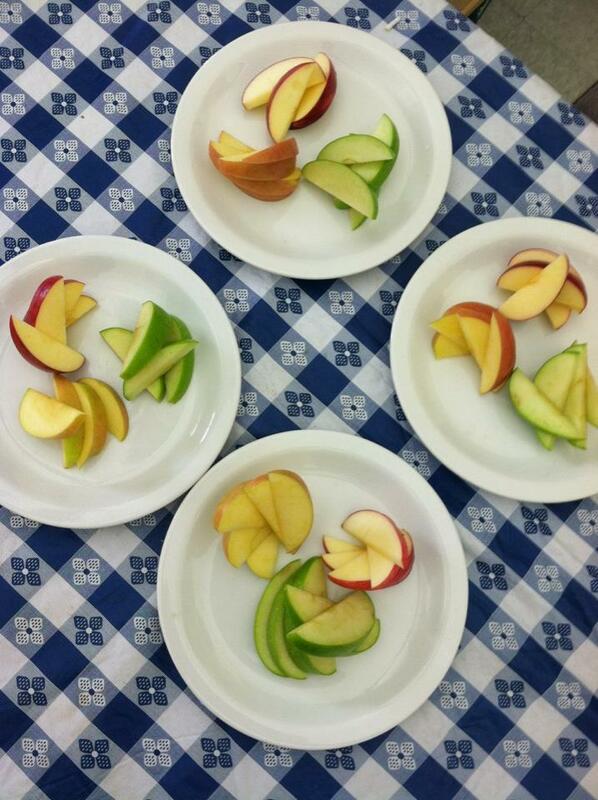 For a special treat, students sample the sweet and juicy Warren pear from Frog Hollow Farm. 4th grade students demonstrated their cooking skills by working in teams to create a salsa recipe focusing on their sense of taste and sight. Each team selected their ingredients, tools, and then divided out the tasks. Students showed excellent teamwork and communication during the challenge, as well as problem solving skills. 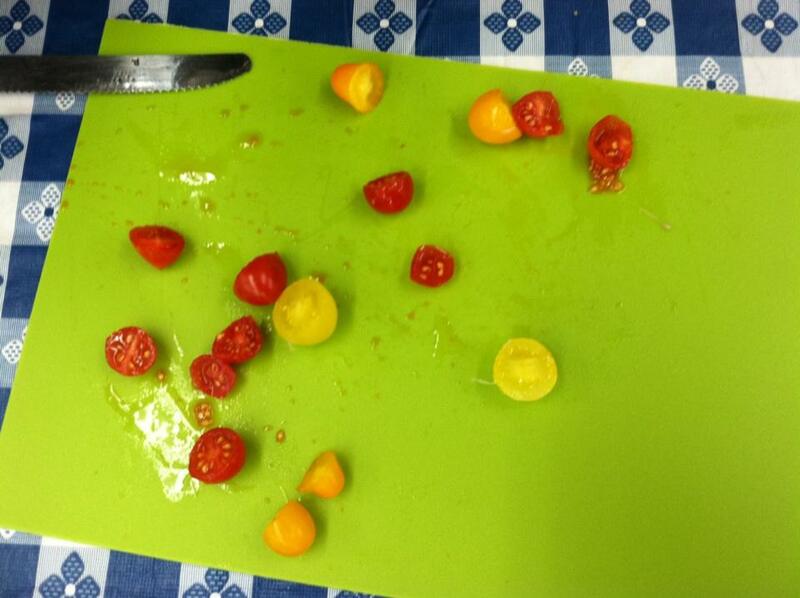 Many enjoyed tasting sweet mini charm cherry tomatoes from Riverdog Farm offered at the table as they prepared their salsa. Afterwards, we learned that using the same ingredients can produce very different results, one salsa was chunky, another was soupy, one looked like the sunset. 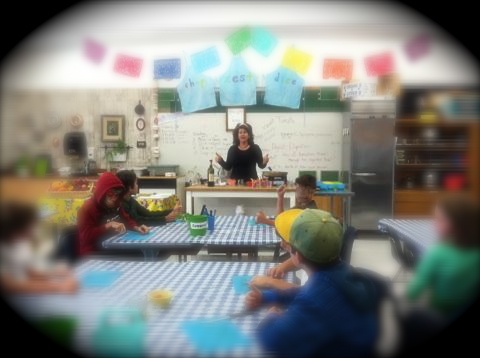 Each team recorded the steps of their recipe from a suggested list of words, giving creative titles like, Colorful Salsa, Salsa Surprise, and The Seasonal Salsa. Although each salsa was distinctly different from the other, there was one unifying characteristic— all were flavorful and delicious! Fifth graders explore the properties of a tomato and how it travels through the digestive tract in their science of cooking class. 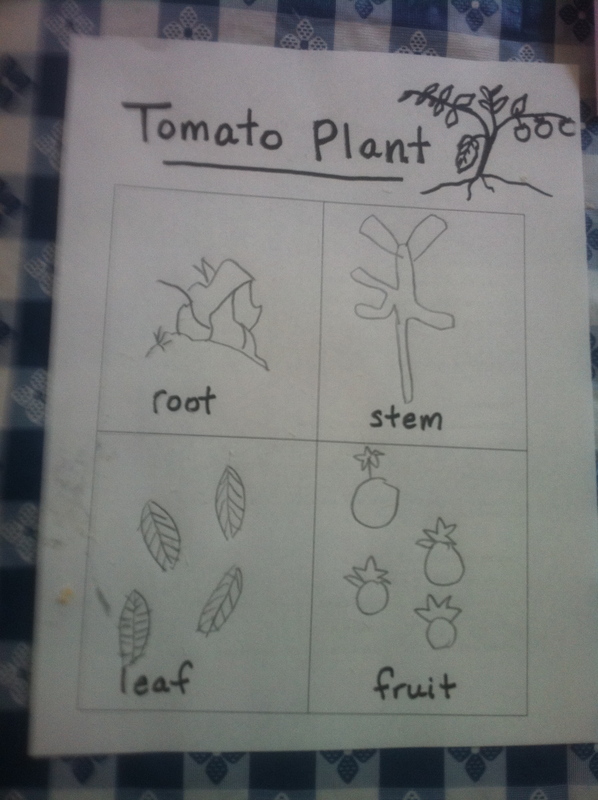 First grade students identify and draw the parts of a tomato plant. Moving into our new classroom. 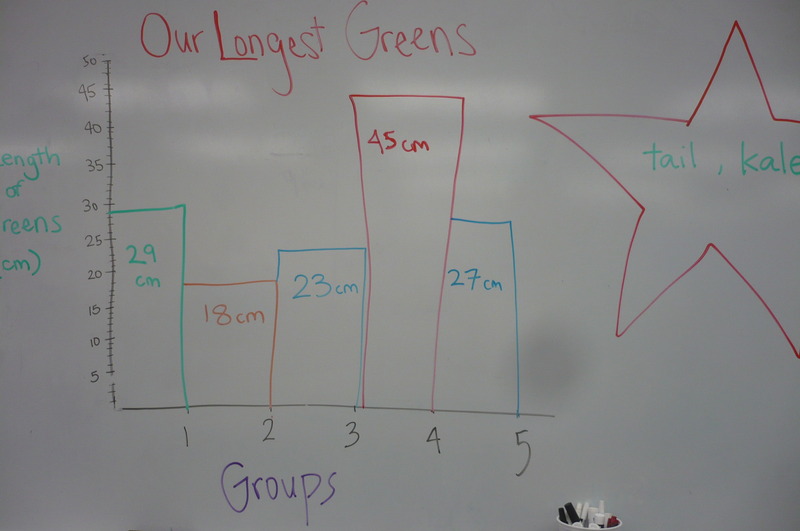 Students measure and record their greens. A poem written by a second grade class about citrus fruits. Students brainstorm compound words related to food. 8-year-old Yoga student re-tells the story of the two wolves followed by a How-to do Mountain Pose in 3 steps. I like this web blog very much so much good info. Thank you for that feedback! I don’t know why… but I felt teary eyed when I read this post. It is so beautiful what animals can do for humans. Even with young adults to senior citizens enjoy the therapeutic elements of a sweet caring animal. My university has this program called, “Fluffy Friends for Finals,” and people around the community bring their dogs so college students can play with them. It is a great stress reliever, and no matter how worried or anxious I am, the dogs always make me laugh. Your response is so sweet, and I agree, the benefits of a sweet caring animal are limitless. I heard about a program at Yale University where students can check out a dog from the school’s library to alleviate stress. I’m so glad your school recognizes the value of offering this service. Thanks for your comment!